It’s not enough to just know your spark. You have to grow it! And that’s where Sparks Champions come in. Spark Champions are adults who help young people develop the interests, skills, commitments or qualities that give their lives purpose and meaning. Spark Champions are the key to true thriving: Research shows the big benefits of identifying your sparks only kick in when paired with adult support. Unfortunately, research says only 37 percent of teenagers say they both know their spark and have adult help to nurture it. Offer new sparks opportunities: Take a kid to a museum, sign a teen up for a class, etc. Want to help the young people around you discover their passions? 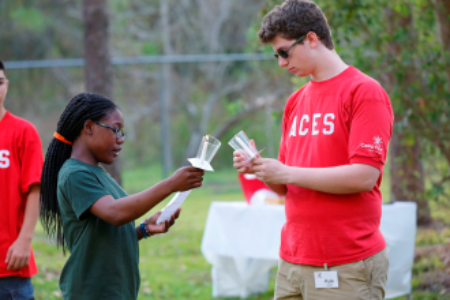 Come volunteer with Camp Fire!